RENTAL PERIOD: Regular rental period is from 1 to 30 days, except in July and in August when the minimum rental length is 3 days. If you would like to rent a car for more then 30 days please contact us. DOWN-PAYMENT & SECURING A BOOKING: No down-payment is required to proceed to a booking, but you need to guarantee your booking with a credit card. RATES INCLUDE: Maintenance, oil, small road map, baby seat (upon request), taxes, 3rd party insurance and unlimited mileage.. MINIMUM RENTAL: One (1) day (24 hours). Any extra hour will be calculated at 1/5 of the daily rate. RENTER’S AGE: Minimum of 23 years old. DRIVING LICENSE: Renter must hold a driving license for at least one (1) year. TRAFFIC FINES: All traffic fines, as well as fines for any violation of the Greek Penal Code are under the responsibility of the renter. INSURANCE:All rental rates include third party liability coverage. In case of an accident, the renter is obliged to pay in full any damages and/or all loss of income due to the immobility of rented car, unless there is a satisfactory proof that damages were caused by another party or below C.D.W. has been undertaken. COLLISION DAMAGE WAVER: The renter will-in case of damages to the rented car-only pay the first 500€ for all car types/classes. The rest will be covered in full by this insurance, provided that the renter has agreed to pay a daily extra rate of 10€. a)The damage is not due to any violations of the Greek Traffic Law and/or the Greek Penal Law. b)Damages to the bottom-side of the car or to the wheels and tires are not covered by any insurance. FUEL: All vehicles must be returned with the same amount of fuel as given. Otherwise, the difference has to be paid to the rental office. Refunds cannot be given on unused fuel. 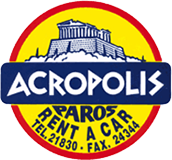 DELIVERY & COLLECTION OF CARS: Free of charge to airports, harbours and hotels (Antiparos is excluded). FERRYING THE VEHICLES IS FORBIDDEN without the prior written authorisation of the rental office (Antiparos is excluded). RATES: Subject to change without prior notice according to the Greek National Tourist Organisation (EOT).